Visit some of the Most Haunted Locations in Salt Lake City on this 1.5 Hour Tour! Travel around to the locations of actual hauntings, hear the details of what happened and bring your camera to see if you can experience them yourself. We will not merely take you on a history tour of the city but a fully interactive adventure where you can experience the most haunted places in town. We get off the bus at almost all the locations to get up close and personal. This will allow you to try some of the ghost hunting equipment provided and to take pictures. If you’re aching to go inside the buildings and get more intimate, we also offer Paranormal Investigations where you spend the whole time inside a haunted building at night, alone, and in the dark! Travel away from the heart of the city for 1.5 hours and visit the dark shadows of where Ted Bundy once roamed, The Old Fort Douglas Cemetery, The Premiere Gentile Gentlemen’s Club in the early history of Salt Lake City, The Old Haunted Library, The Hancock Mansion, and many more locations. The tours begin at 18 West (Approx) South Temple Just West of Main Street in downtown Salt Lake City on the north side of the street. 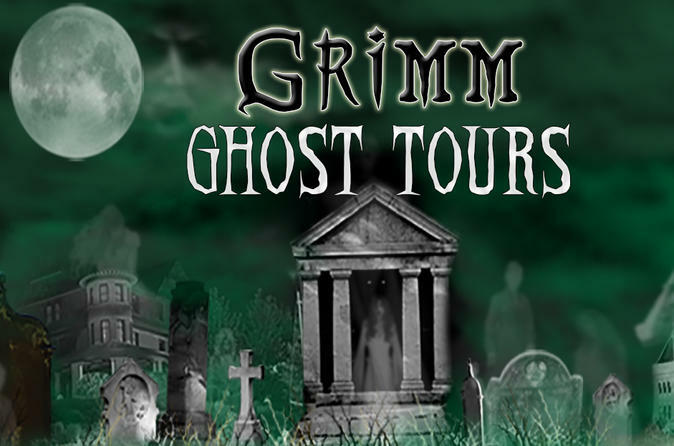 Look for our Grimm Ghost Sign or the Black Grimm Ghost Tours Bus. Tours leave on schedule so please arrive at least 10 minutes early to be guaranteed a seat. Parking is free at the meters along the streets at night. Another option is to use the free downtown public transit system "TRAX" and exit at the Temple Square Station. Tours may be canceled due to severe weather. If tours are canceled your tickets will be valid for another tour.